Biblical ABC Learning will enable children to learn the alphabet and about the Bible together! Children will enjoy enlightening illustrations as the read and learn the alphabet and about various people, places, events, words of praise and books of the Bible. Each letter/word is accommodated with book, chapter(s) and scripture(s) to reference and continue learning more! 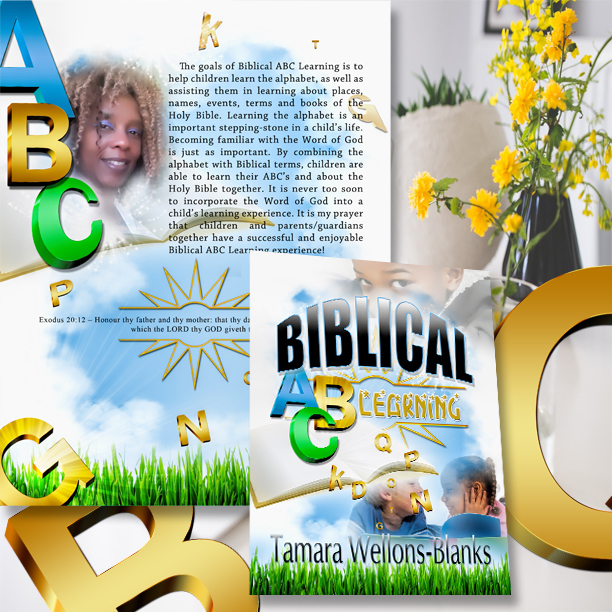 BIBLICAL ABC LEARNING CAN BE VIEWED AND PURCHASED ON AMAZON.COM OR BY CLICKING ON THE LINK BELOW! To place an order for an autographed copy of Biblical ABC Learning, send a request to majesticlioness78@gmail.com using "Autograph Copy" as the subject. After receiving the request, and invoice will be emailed for payment submission. Be sure to include your name and mailing address to receive your copy. Biblical ABC Learning Tees are available for ordering! Designs and pricing can be viewed on my websites. To place an order for a Biblical ABC Learning Tee, send a request to majesticlioness78@gmail.com using "Tshirt Order" as the subject. Once the request has been received an invoice will be emailed detailing your choices and price. Please review your invoice carefully before submitting your payment to ensure your design choice(s) and size(s) are correct. Also, be sure to specify adult/child sizes. T-shirt orders are placed once per week on Friday by 3:00 PM. The next order will be submitted today. There is still time to place your order before this week's order is sent to the company for production. Continue to visit & follow my websites and social media for updates, info and more!